In the movie Stardust Memories, Woody Allen echoed the sentiment of many Americans when he referred to pigeons as ‘rats with wings’. Each society has their own set of rules when it comes to the ranking and treatment of different animals, so it comes as no surprise that the storied past time of pigeon racing, currently gaining popularity in China, has yet to catch on in the US. Pigeon racing has rich cultural roots all over western Europe, and training carrier pigeons has been the privilege of noblemen throughout history. It is said the Rothschild family banking dynasty benefited from receiving advance news of Napoleon’s defeat at Waterloo from their homing pigeon. 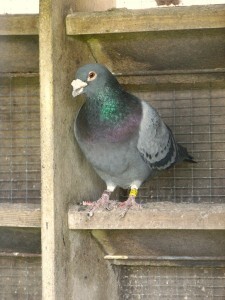 Modern pigeon racing first gained momentum in the mid 19th century, when Belgian practitioners of the sport began breeding the animals for speed and endurance. Similar to horse-racing in the US, opportunities to bet on racing pigeons have become big sponsored events in China. The most expensive pigeon in the world was sold to a wealthy Chinese buyer, who shelled out $200,000 at a Belgium auction for a highly pedigreed racing pigeon. Known as Blue Prince, this ‘designer’ pigeon seems a breed apart from the plump, trash-foraging birds commonly seen in urban parks. Currently living out his retirement on a Chinese roof top, Blue Prince is no longer expected to race, but was purchased to breed more speedy champions like himself.